Federal subpoena against Quinn agency responsible for NRI. A federal prosecutor based in Chicago has issued a subpoena against the Illinois Criminal Justice Information Authority, a State panel that monitors funding for crime-fighting activities statewide. The subpoena was dated August 27 and was made public on Tuesday, September 18. The Authority was the successor-in-interest to the 2010 Neighborhood Recovery Initiative (NRI), a $54.5-million program funded by Democrats in the Illinois General Assembly that targeted State taxpayer general funds toward social-work initiatives. Documents uncovered as a result of the August 2014 NRI subpoena could be presented to a special grand jury convened earlier this year. The grand jury, operating under the supervision of the U.S. Attorney, has been asked to look into the issue of possible NRI corruption. A Chicago Tribune summary of the new subpoena and what it means for Illinois’ political future can be found here. Republicans push for economic development. Meeting on Tuesday, September 16, the General Assembly’s Joint Committee on Administrative Rules (JCAR) demanded that the Illinois Department of Natural Resources (IDNR) look at their rules to oversee horizontal shale drilling (“fracking”) in Illinois, and make changes to ensure that these rules follow the State law passed last year that authorizes and spurs frack drilling. JCAR will reconvene on Tuesday, October 14, and members of the Committee have told IDNR they want the Department to extensively revise its rules so that they will conform to the May 2013 state fracking law, SB 1715. Fracking has been authorized in many states, including the energy-producing states of North Dakota and Texas and the neighboring state of Indiana, and has become very successful. Rep. David Reis, from a district in southeastern Illinois that stands to increase energy production and create jobs with the inauguration of significant, permitted fracking activity, has demanded that the State take action on new rules that will be faithful to the 2013 law. Comptroller counts $5.32 billion in unpaid bills. The current count of unpaid bills was submitted to her Facebook followers by Comptroller Judy Baar Topinka on Tuesday, September 16 under the Twitter hashtag #ILbillbacklog. The $5.32 billion figure includes $3.08 billion in bills actually presented to the Comptroller for payment. An additional $2.2 billion is estimated to represent debts, owed by various departments controlled by Gov. Quinn, that have not yet been presented to the Comptroller for payment. The Comptroller generally pays bills in the order received, which means that a creditor with a legitimate claim for payment may have to wait months for a check. Comptroller Topinka’s summary of bills presented to her Office appears in “Monthly Money Matters,” a monthly spreadsheet summarizing the cash-flow situation of the State. Persons interested in the State’s fiscal condition may wish to subscribe to this spreadsheet, which is updated monthly. Propane users prepare for 2014-15 winter. Midwestern distributors and consumers of propane are preparing their supplies with the goal of not getting caught as some customers were in the winter of 2013-2014. During the “polar vortex” cold months at the beginning of this year, propane hoarding occurred throughout the American Midwest and the price of the liquid fuel spiked above $7.00/gallon, causing severe hardships to many farmers and rural residents who depend upon the natural-gas byproduct to heat their homes and agricultural buildings. As with other commodities, propane can be purchased ahead of the date contractually agreed upon for delivery. Many larger users of propane, such as commercial grain elevators, have nailed down adequate supplies. Substantial propane gallonage must be used annually to dry wet grain harvested from damp Illinois fields, and autumn rain showers have an effect on statewide supplies. However, propane suppliers and distributors report increased inventories relative to early fall 2013. An Associated Press news story, datelined Tuesday, September 9, describes the current situation in the U.S. Midwest. Hiring activity steps up at new Thomson federal prison. The federal Bureau of Prisons, a division of the U.S. Department of Justice, opened a three-day hiring fair in Thomson on Tuesday, September 16. The three-day informational activity was aimed at informing interested parties and potential applicants of employment opportunities for work at the facility, which will house persons convicted of criminal offenses in federal court. Typical federal prisoners include persons involved in the international or interstate transportation of illegal drugs. Hires will include the security professionals who will maintain a perimeter around the 1,600-cell facility. Built as a maximum-security prison by the State of Illinois, the former Thomson Correctional Center was sold to the Bureau of Prisons after negotiations starting in 2010. The active operation of the prison is expected to create up to 1,000 jobs in northwestern Illinois. An Associated Press news story describes the hiring status of the new prison. State planes, helicopter offered for sale. Headed by a 1999 Beechcraft King Air, a portion of the State air fleet traditionally used to shuttle high-ranking State officials throughout Illinois has been put on the auction block. The auction sale, which includes eight light planes and one helicopter, can be monitored at the State’s iBid website. Bids are scheduled to be accepted until Monday, September 29. In Fiscal Year 2014, the Illinois Department of Transportation (IDOT) spent more than $7 million to operate and maintain the State’s fleet of aircraft. IDOT has spent nearly $33 million over the last five years on the air fleet, while costs have gone up by 35 percent. Mitchell feels the daily shuttles between Chicago and Springfield are a waste of taxpayer dollars and should be stopped. Land condemnations step up. Proposals continue to move forward with the aim of constructing a “third airport” on what is now Will County farmland between Monee and Peotone, Illinois. The air facility, which would be Chicago’s third major airport, would specialize (at least in its initial operation) in air-freight needs. Proponents say the third airport would create jobs in Chicago’s south suburbs and could relieve air-freight pressure on Chicago’s two existing airports, especially during nighttime hours. Chicago air freight primarily moves in and out of O’Hare and Midway International Airports. Despite the overall demand for air freight capacity in northeastern Illinois, it is not clear when the Peotone airport will be constructed. The Federal Aviation Administration, whose consent is required for any major U.S. airport construction proposal, has not yet granted final approval to the Peotone airport plan. Furthermore, downturns in U.S. passenger ticket purchases after 9/11 raise questions about when the potential passenger side of a future Peotone airport will be adequately supported by ticket sales. However, the Illinois Department of Transportation (IDOT) has already spent $86 million in preliminary third airport planning activities and real estate acquisition. Now, IDOT has begun to prepare Peotone land-condemnation proceedings. These proceedings are intended to force local owners of real estate located within the projected airport’s “footprint” to submit their parcels for quick-take involuntary land transfer. Real estate acquired by IDOT could be used for the proposed airport’s runways and infrastructure. As of Tuesday, September 2, IDOT had initiated 11 condemnation cases and is preparing 13 more for filing. On Monday, September 15, Crain’s Chicago Business had the story. Illinois’ rush-hour traffic scene labeled nation’s fourth-worst. The study, based on 2011 data analyzed by the Reason Federation, indicates that 55.25% of the State’s peak-period interstate highway use takes place on highway lanes defined as “congested.” Peak periods are defined as from 6:00 a.m. to 10:00 a.m. each weekday morning, and from 3:00 p.m. to 7:00 each weekday evening. Eight highly urbanized states, including Illinois, force more than half of their total expressway peak-period drivers to endure congested conditions. The Illinois congestion numbers represented an increase from 41.13% in 2009, although the study changed its methodology after 2009 to redefine more urban expressway driving as congested. The current Reason Foundation definition of “congested driving” defines rush-hour traffic conditions as a condition where a driver is forced to move at less than 85% of the speed limit. In a story published on Wednesday, September 17, the Chicago Sun-Times described the findings. Get the Week in Review emailed directly to your inbox! Sign up today to get a first-hand look at the continuing legislative and fiscal challenges facing policymakers in Springfield. 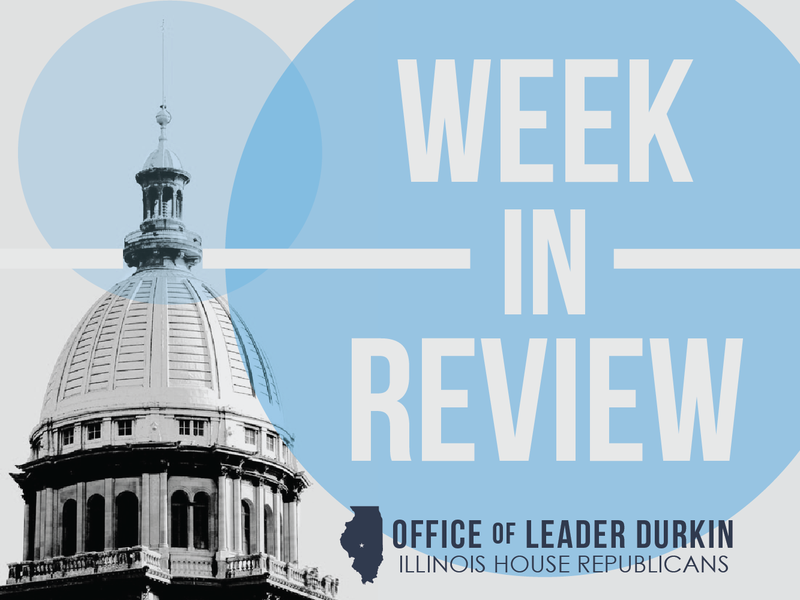 With increasing attention being paid to controversial Illinois administrative rules and actions, the “Week in Review” is more essential than ever as a way to follow major Illinois issues, questions, and trends.